Genesis Splatterhouse 2 (USA) in 14:15.5 by Aqfaq. 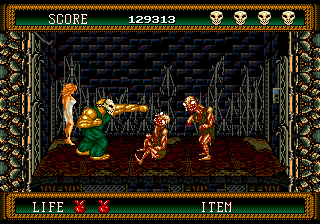 Splatterhouse 2 is a splatter-themed beat 'em up/action game featuring a skull-masked guy fighting against undead creatures to save a girl. It is also the sequel to this game. Watch as Aqfaq takes a leisurely walk by hordes of zombies and other monsters, abusing some sliding tricks to maintain fast speed and defeat bosses quickly. In waiting periods, Aqfaq also shows some stunts, such as having monsters fall on his foot, delivering some wicked suckerpunches, or toying with the damsel in distress. NOTE: The game is unofficially rated "PG-13" for violence and gruesome images.